Important villages within the influence of the old Ston community are Luka Hodilja and Duba Stonska, to the west on the northern coast. The first village is primarily occupied with fishing and the cultivation of mussels. The mussel operation is located next to the church of St Vitus which was founded during the Renaissance period (1390s), as is confirmed by an inscription on the house of a nobleman of 1664. >Rocks and olive groves surround the second village, with the church of St Nicholas, built as a vow by an unknown foreigner from Mantova in 1469. 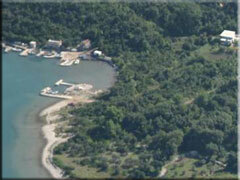 This bay north of Ston has all the necessary natural and ecological conditions for the cultivation of mussels. Some islets in this gentle archipelago are inhabited while the islet of Crkvina keeps its church ruins a mystery.